In 1973 AMC produced 5,707 AMXs with a base price of $3,191 and a shipping weight of 3,170 pounds. AMC also produced 25,195 Javelins in '73 that had a base price of $2,889/$2,983 with a weight of 2,868/3,104 pounds (6 cyl/8 cyl). The 1973 AMC Javelin AMX that I purchased has a 401 engine, 4 speed on the floor BW T10 transmission, and a AMC 20 rear end. The car has power steering, power brakes, and the GO PAK option. The 401 is equipped with Hedman Hedders, Crane cam (click for specs), custom head work, and an Edelbrock Performer Series Square-Bore 600 cfm Electric choke (#1406) carburetor. 3 -> Model year is 1973. 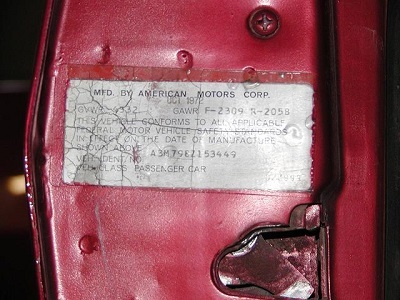 The code from the tag on the engines valve cover is 509Z28 which means a 401 built on 9/28/1972. The Borg Warner T10 most likely has the close ratio of 2.23, 1.77, 1.35, and 1:1. Trim code is 341S which is black vinyl. 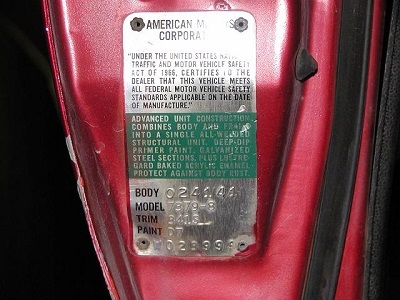 Paint code is D7 which is Trans AM Red, this is a sort of orange red. The car is currently painted 1995 Ford truck Electric Currant Red. I took a quick look at the rear end for the gear ratio code but could not find it. Checked gear ratio by comparing a single tire rotation to a single drive shaft rotation, this is a Twin Grip rear with 3.54 (11:39 ratio) gears.